Delta Orionis is a complex star system and constitutes the westernmost star in the "belt" of the Orion constellation. Two of the stars are massive and orbit one another once every 5.7 days. By observing this system for the equivalent of nearly six days with Chandra, new information about these stars was obtained. Massive stars are relatively rare, but are very important to the evolution of their host galaxies. The westernmost star in Orion's belt is known officially as Delta Orionis. (Since it has been observed for centuries by sky-watchers around the world, it also goes by many other names in various cultures, like "Mintaka".) Modern astronomers know that Delta Orionis is not simply one single star, but rather it is a complex multiple star system. 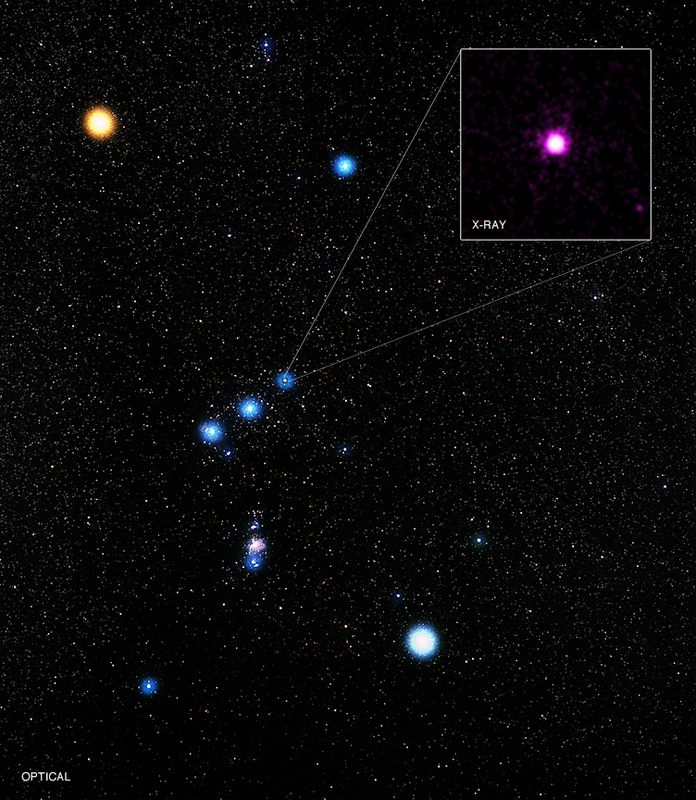 Delta Orionis is a small stellar group with three components and five stars in total: Delta Ori A, Delta Ori B, and Delta Ori C. Both Delta Ori B and Delta Ori C are single stars and may give off small amounts of X-rays. 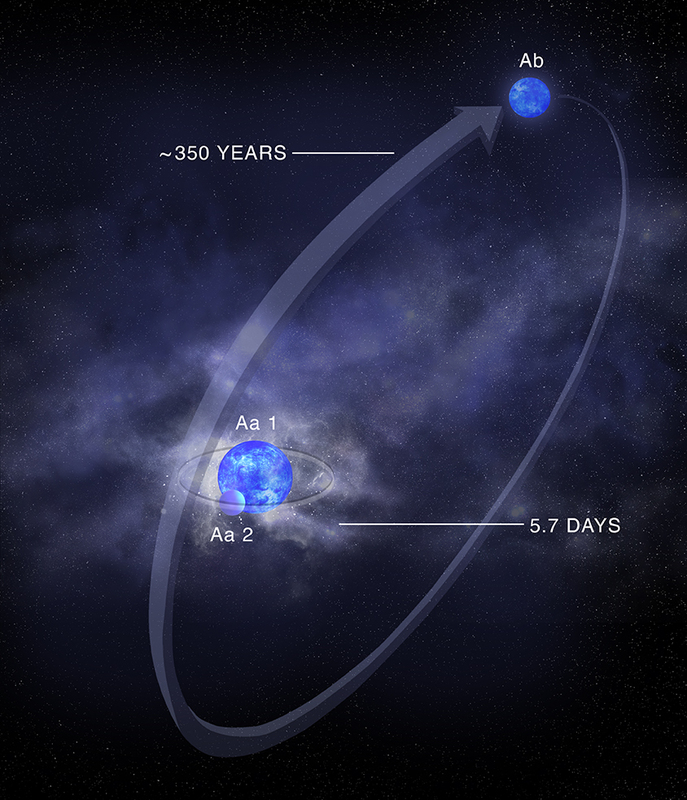 Delta Ori A, on the other hand, has been detected as a strong X-ray source and is itself a triple star system as shown in the artist's illustration (below). In Delta Ori A, two closely separated stars orbit around each other every 5.7 days, while a third star orbits this pair with a period of over 400 years. The more massive, or primary, star in the closely-separated stellar pair weighs about 25 times the mass of the Sun, whereas the less massive, or secondary star, weighs about ten times the mass of the Sun. The chance alignment of this pair of stars allows one star to pass in front of the other during every orbit from the vantage point of Earth. This special class of star system is known as an "eclipsing binary," and it gives astronomers a direct way to measure the mass and size of the stars. Massive stars, although relatively rare, can have profound impacts on the galaxies they inhabit. These giant stars are so bright that their radiation blows powerful winds of stellar material away, affecting the chemical and physical properties of the gas in their host galaxies. These stellar winds also help determine the fate of the stars themselves, which will eventually explode as supernovas and leave behind a neutron star or black hole. By observing this eclipsing binary component of Delta Orionis A (dubbed Delta Ori Aa) with NASA's Chandra X-ray Observatory for the equivalent of nearly six days, a team of researchers gleaned important information about massive stars and how their winds play a role in their evolution and affect their surroundings. The Chandra image is seen in the inset box in context with an optical view of the Orion constellation obtained from a ground-based telescope. Since Delta Ori Aa is the nearest massive eclipsing binary, it can be used as a decoder key for understanding the relation between the stellar properties derived from optical observations, and the properties of the wind, which are revealed by X-ray emission. 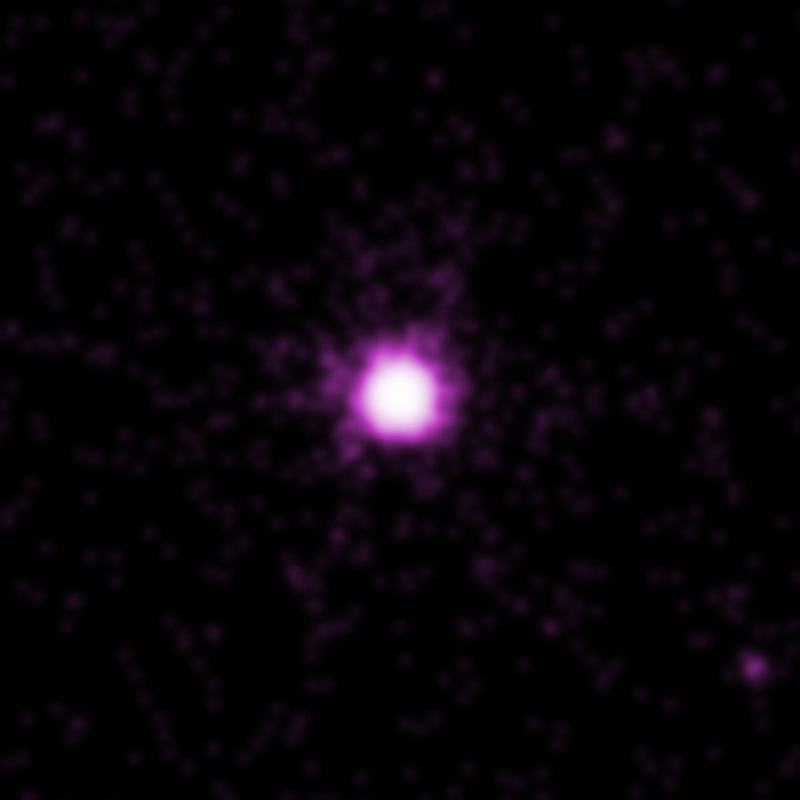 The lower-mass companion star in Delta Ori Aa has a very weak wind and is very faint in X-rays. Astronomers can use Chandra to watch as the companion star blocks out various parts of the wind of the more massive star. This allows scientists to better see what happens to the X-ray emitting gas surrounding the primary star, helping to answer the long-standing question of where in the stellar wind the X-ray emitting gas is formed. The data show that most of the X-ray emission comes from the wind of the giant star, and is likely produced by shocks resulting from collisions between rapidly-moving clumps of gas embedded within the wind. The researchers also found that the X-ray emission from certain atoms in the wind of Delta Ori Aa changes as the stars in the binary move around. This may be caused by collisions between winds from the two stars, or from a collision of the wind from the primary star with the surface of the secondary star. This interaction, in turn, obstructs some of the wind from the brighter star. Parallel optical data from the Canadian Space Agency's Microvariability and Oscillation of Stars Telescope (MOST) revealed evidence for oscillations of the primary star produced by tidal interactions between the primary and companion star as the stars travel in their orbits. Measurements of the changes of brightness in optical light plus detailed analysis of optical and ultraviolet spectra were used to refine the parameters of the two stars. The researchers were also able to resolve some previously claimed inconsistencies between the stellar parameters and models of how the stars are expected to evolve with time. These results were published in four coordinated papers that were recently published in The Astrophysical Journal led by Michael Corcoran (NASA's Goddard Space Flight Center & Universities Space Research Association), Joy Nichols (Harvard-Smithsonian Center for Astrophysics), Herbert Pablo (University of Montreal), and Tomer Shenar (University of Potsdam). NASA's Marshall Space Flight Center in Huntsville, Alabama, manages the Chandra program for NASA's Science Mission Directorate in Washington. The Smithsonian Astrophysical Observatory in Cambridge, Massachusetts, controls Chandra's science and flight operations. Coordinates (J2000) RA 05h 32m 00.40s | Dec -00° 17´ 56.70"
If the stellar wind determines whether a neutron star instead of a black hole results from the star's demise which isn't quite clear from the statement, then it must be because mass is removed by this wind. But I always thought the mass of the core, which presumably doesn't blow away in the stellar wind during the star's main sequence life, was what mattered. As for Roberto Markham's question, both stars orbit the system's center of mass, which will lie closer to the heavier star. I have enjoyed reading Chandra for years. And have copied many photos to post for my Groups and always get great comments on the beauty of our universe. But the colors you used on that photo, of Orionis, is just too spectacular. Thank you for that treat to my eyes. I have difficulty in understanding this concept. Surely one must orbit around another or both orbit around a fixed point in space. A complex star system and constitutes the westernmost star in the "belt" of the Orion constellation. About 1,240 light years from Earth. 462 x 540 light years. X-rays are pink, optical are red, green and blue.